The statutory provisions for service of notices etc. in certain circumstances are provided in section 169 of the CGST Act, 2017. (g). If such affixing is also not practicable, by affixing a copy thereof on the notice board of the officer who has passed such decision or order or issued such summons or notice. · In Saradha Travels versus CST, Chennai 2014 (7) - MADRAS HIGH COURT it was held that pasting adjudication order on premises of assessee under a Mahazar before two independent witnesses, when assessee was not available in premises and premises was also locked, is a valid service under section 37(1)(b) of Central Excise Act, 1944. · In Saral Wire Craft Pvt. Ltd. versus CC, CE & ST 2015 (7) - SUPREME COURT where adjudication order was served on kitchen boy of the assessee, it was held to be not a proper service. As per section 37C of the Central Excise Act, 1944, notice must be served to the person for whom it is intended or his authorized agent under proof of acknowledgment. It is the basic principle of law long settled that if the manner of doing a particular act is prescribed under any statute, the act must be done in that manner or not at all. The judgment lays down the pre-requisite for issuance of notice. Any notice issued in violation of section 37C is not valid. It is worth mentioning that section 37C has been made applicable to service tax also by virtue of section 83 of the Finance Act, 1994. Hence, the principle laid down in the judgment shall mutatis mutandis apply to notice served in service tax cases also. · In Ventrapathi Financial Services versus Superintendent of Central Excise 2015 (7) –ANDHRA PRADESH HIGH COURT, where ex parte adjudication order, show cause notice and other communications were sent at wrong address and petitioner came to know only when bank informed about recovery proceedings, it was held that principles of natural justice were violated and service of order was not in terms of statutory provisions and as such impugned order was set aside. Adjudication proceedings were ordered to be completed afresh within three months. · In CST versus Sunil Haribhau Pote 2017 (4) - BOMBAY HIGH COURT, assessee was engaged in manufacture and sale of edible oils, the department served notice at correct address of assessee, but it was returned by the postal authorities with the remark, that the addresses refused to accept the notice. It was held that there was no dispute about his identity, so it amounted to sufficient and adequate service of notice i.e., deemed to be served. (c) Other communication such as letter of enquiry, notice of hearing, seeking details or information, audit report, recovery notice etc. These terms have not been defined but shall take their meanings under General Clauses Act. Such communications are required for administration of the tax law under various provisions. 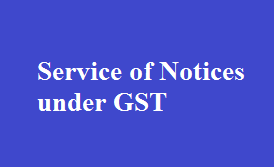 Every decision, order, summon, notice or any communication shall be deemed to have been served to the addressee on the date on which it is tendered or published or a copy thereof is affixed in the manner as provided in section 169(1) of the CGST Act, 2017 Service in case of registered or speed post. Any decision, order, summons, notice or any other communication shall be deemed to be served where such communication is sent by registered post or speed post in terms of section 169 (3). Accordingly, when any such communication is sent by registered post or speed post, it shall be deemed to have been received by the addressee at the expiry of the period normally taken by a registered/speed post letter in transit unless contrary is proved. Following judicial pronouncements can be relied upon for communications sent by speed post or registered post. · In Mirzapur Electrical Industries Ltd. versus CCE, Allahabad 2013 (4) - ALLAHABAD HIGH COURT, since object of sending post by registered post was to keep a record, which was also served by sending an article by speed post through same agency, 'Registered Post' and 'Speed Post' were considered to be same modes of service and sending order by speed post was held to be a valid compliance with section 37C of Central Excise Act, 1944. Hence, where assessee had not given forwarding addressing for communication, envelope was returned back undelivered and revenue made an attempt to serve assessee by pasting order on factory gate, it was considered to be valid compliance. communication of notices through speed post was in consonance with law.